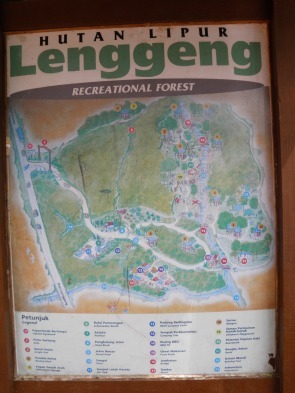 I made a quick visit to Lenggeng Recreational Forest the other day (May 2011) together with my family. We were on the way home after spending an enjoyable few hours at nearby Broga where we saw the newly completed Monkey King statue and petted the animals at Rabbit Funland. 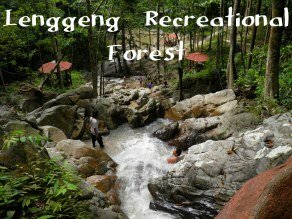 My map indicated that there was a recreational park in the Lenggeng Forest Reserve so we made a short detour to investigate. The faded map displayed at the entrance showed a relatively small park whose main feature is a stream and a 20 foot waterfall. Apparently this park was opened to the public in 1984 and the man-made facilities such as picnic gazebos, children's playground, bridges and pathways could do with some renovation. The toilets were in a state of disrepair. The attempt to dam the stream and create a fresh water swimming pool had been damaged by successive years of flash floods. Despite this however, the park's natural attractions such as the waterfall remained unspoilt and you could enjoy the ultimate power shower by sitting in the pool under one of the cascades. It was a public holiday when we visited but the park was not busy. If you go on a weekday you would probably get the waterfall to yourself. We could not penetrate far beyond the first cascade as the path was overgrown. 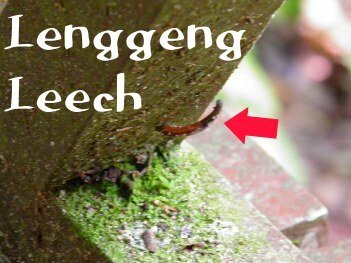 Within a few minutes of walking in this overgrown area I felt a leech on my ankle. Luckily it had not yet sunk its teeth into my leg, possibly put off by the anti-mosquito wipes which I had just applied, so it was easy to flick it away. It found a new spot next to the path where it would await the next juicy leg to walk by. There was no entrance fee to the park so we cannot complain about the state of the facilities but I doubt if I will bother to go back there again. Next time I might try the Jeram Toi Waterfall which is located a few minutes drive away. The location is marked on my interactive map. Look for the N30 road between Lenggeng and Pantai.